Despite offering some fantastic smartphones, LG failed to make a noticeable impact last year. The company is hoping for a better 2018 with the LG G7 ThinQ, yet another excellent smartphone, with a super-bright display, a great look, and unique camera and audio experiences. LG certainly got a lot right here. However, as is the case with any device, the LG G7 has a few problems users have to deal with. Here are some of the most common LG G7 problems, and some potential solutions! Disclaimer: Not every owner will face these LG G7 problems. In fact, it is more than likely that you won’t come across of any of these issues at all. Since the phone’s launch, backlight bleed has been one of the LG G7’s most reported problems so far. It was first seen on some demo units and quite a few users have come across this problem since launch as well. The light bleed tends to pop up around the bottom of the display, in between the capacitive home button and the recent apps key. Some have found multiple spots or different locations. Unfortunately, there is no easy DIY solution to fixing backlight bleed. Since it involves taking the phone apart in some way, it is best left to LG service centers. Of course, you could, and should, also pick up a replacement. The good news is this problem seems to be limited to a particular batch of devices, and the replacement devices users have received don’t have any light bleed anymore. Some users have found that the auto-brightness feature doesn’t work as expected. In a few cases, users have found that the brightness doesn’t go below 11 or 12 percent even if in very dark areas. This was an issue with the LG G6 and is in the LG G7 as well. Some users have found the battery percentage doesn’t appear at the top right corner of the screen in the status bar even with all the required settings enabled. The number shows up when the notification panel is pulled down. This seems to be a simple bug that will hopefully be fixed in an upcoming update but has become one of the more common LG G7 problems. A variety of workarounds have also worked for different users. Go to Settings > Battery and toggle off and on the “Battery percentage on status bar” setting. For some users, that is enough to fix this problem. Also, go to Settings > Display > New Second Screen and ensure Standard is the selected option. A few users found performing a Factory Reset (you can find the instructions on how to do so below) solved the issue. However, we recommend this step as a last resort as you will lose all your data and have to set up the phone from scratch (don’t forget to back up anything important) . Most users who have faced this issue have found that it seems to related to the display size. Go to Settings > Display > Display Size and set it to the smallest size. This brings the battery percentage number back next to the battery icon in the status bar. As with any new device, connectivity issues with Bluetooth and Wi-Fi are common LG G7 problems as well. Both Wi-Fi and Bluetooth issues are prevalent with this device. Go to Settings > Power saving and ensure that this option is turned off. No app drawer: Out of the box, the LG G7 comes without an app drawer. All your apps are spread out across the home screens, and using folders is one of the ways to keep things organized. Luckily, LG offers a simple solution to bring back the app drawer and you won’t have to switch to a different launcher to get the app drawer back. Go to Settings > Display > Home screen > Select home > Home & app drawer. App scaling: The display of the LG G7 comes with the now standard 18:9 aspect ratio. However, some apps don’t use the entire screen, leaving black bars at the top and bottom. App developers have been updating their apps to accommodate this aspect ratio and the notch. LG also has a solution. Go to Settings > Display > App scaling and you can enable “Fullscreen (18:9)” on any app supporting it. Some software bugs don’t have a workaround available right now. The only option is to wait for LG to solve the problem in an official update. Bluetooth volume sync issues: Some users have found adjusting the volume on their Bluetooth headset or speaker doesn’t change the volume on the phone. So you basically have to set the volume on the device and the headphones separately. Some have even found the volume syncs as expected at first, then stops working after a while. Google Lens app crashing: The Google Lens app crashes when it is opened from the app drawer or home screen or when using the camera app. The only way to get it to work is to ask the Google Assistant to launch Google Lens. 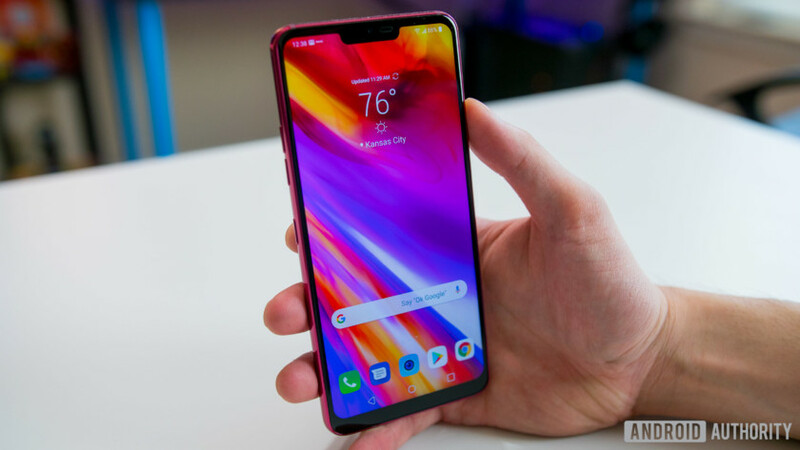 Android Auto issues: The phone’s Android Auto issues have become one of the more widely reported LG G7 problems recently. The app will either not register a command or will get stuck when attempting to complete the command. The app tends to freeze and crash often as well. These are the most common LG G7 problems, and some of their potential solutions! If you have come across any other issues, let us know in the comments section below. We’ll try our best to find an answer for you!